When I heard about media producers Bruktawit Tigabu (Ethiopia) & Nnaemeka Ikegwuonu (Nigeria) recently I immediately thought about Songhai Center in Benin as well as the United African Alliance Community Center in Tanzania, which we've already covered. I realized our mistake in that we hadn't yet dedicated a space here to share what Songhai is all about. Let's set the record straighter. While the previously profiled UAACC is a broadly focused educational project with radio stations and music production studios, Songhai Center, founded by a Father Godfrey Nzamujo (a black Dominican priest), is strictly about sustainable agriculture and technology. Together, these two community based organizations have the complimentary DNA fundamentals of a true African renaissance; UAACC is the "liberal arts University" to Songhai's "institute of agriculture and technology". Songhai is a land-based organization in Benin, West Africa whose stated mission is to: "Aspire to develop alternatives allowing Africans to stand on their feet through agricultural entrepreneurship, in an integrated development framework enhancing agriculture, industry and services. This development is centered, above all, on human development, the realization of local resources and the appropriation of foreign techniques and technologies." In summer 2003, Design that Matters and four members of the MIT Kinkajou design team conducted an extensive field study in Mali and Benin. The objectives of this study were to broaden their network of collaborators among local communities and non-governmental organizations (NGOs), [and] test a prototype educational tool developed by the student team... These notes show two things: One, they illustrate the sophistication of Songhai; Two, they illustrate the great opportunity being taken advantage of by MIT but not, say, Howard University, Florida Agricultural And Mechanical University, or Tuskegee University. Here are some excerpts from the MIT team's observations on Songhai below. 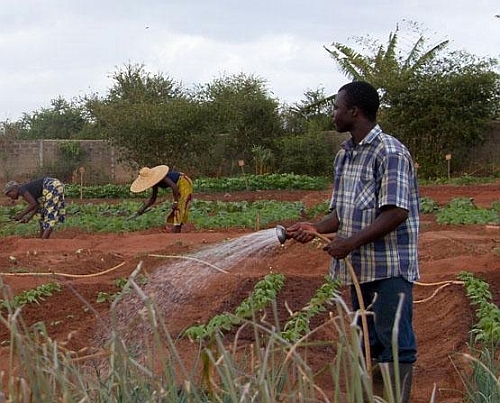 From the Songhai website: "The Centre Songhai is principally involved in agricultural training, research, and production for sustainable livelihood in Africa. Founded... in 1985, the Center has been managed by Africans since then. The Center's aim is to create the conditions for improving the lives of Africans, the great majority of whom live in rural areas. "Centre Songhai is a world leader in innovative development programs, including integrated farming, biomass gasification, microenterprise and IT for rural communities. Father Nzamujo, the 1993 Africa Prize Laureate, is a visionary and an inspiring educator. Songhai has established partnerships and student exchange programs with a number of US universities (Wake Forest, SUNY-Oswego, Colorado State) and has close ties with universities and technical schools across Africa. "Songhai's headquarters are at Porto-Novo in the Republic of Benin. Songhai's partnership now extends to organizations in Europe, America, Asia, and Africa. Songhai promotes agricultural entrepreneurship among the youth in Africa. This is done within an environment where appropriate and positive human values are regarded as essential elements. These young africans are trained to become responsible citizens in their communities; socio-economic entrepreneurs, men and women with initiative and creativity, ready and able to meet the social and economic challenges of the future. This means that, in addition to the knowledge and skills our students acquire at the Center, we also train them to develop a strong desire for change and for a better life. Songhai's training model for human development can be adopted and applied in any part of the world." [...] At this morning's meeting with Songhai director Frere Nzamujo, in addition to the Kinkajou and various other potential DtM projects, we discussed potential applications for Light Up the World's one-watt LED lamps. Rural community lighting is the most obvious application, and Songhai does work with solar lighting systems for their training centers in regions not connected to the grid. A less obvious application, and the one that was the most immediately compelling to Fr. 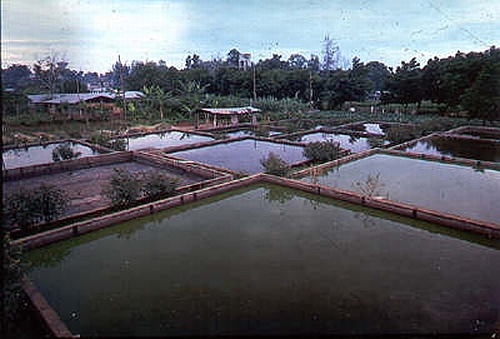 Nzamujo, was the use of LUTW lamps in Songhai's fish and poultry hatcheries. A reliable source of low-power lighting would allow them to increase the growth rates of fish larvae, and would encourage their chicken to lay more eggs. The fact that an LED bulb has an average lifespan of 20,000 hours--that's almost three years of continuous use--made it an attractive alternative to incandescents and fluorescents. [...] We left three LUTW lamp sets with Fr. Nzamujo for testing in their hatcheries. They are looking forward to contacting David Irvine-Halliday and his colleagues at LUTW, and they have promised to send us details and data from their various test installations on the farm. [...] Centre Songhai was a gold mine for potential DtM design challenges. They also have the facilities and trained staff necessary to build and test many existing DtM prototypes. Finally, they have an extensive network of collaborators both with in West Africa and abroad, with whom they can exchange ideas and disseminate successful new designs. [...] We collected a trunk-load of preliminary data on a number of potential DtM design challenges, including this prototype palm nut shelling machine, based on a Nigerian design and currently in development at the Centre. [...] Fr. Nzamujo also asked DtM to look into continuing the development of a low-cost reduction gear for their various agricultural-processing equipment. Shown below is an expensive reduction gearbox imported from the US, alongside a less expensive gear set built at Songhai, made from a gearbox salvaged from a Peugeot 504. [...] According to Nzamujo and the staff at Centre Songhai, the toughest problems--"casse-têtes" or literally head-breakers--also involve agricultural production. Songhai is committed to developing methods for micro-production of agricultural goods, in other words, tools for adding value to the raw produce of rural agriculture. These include shelling machines, peeling machines, juice-making machines, seed presses, cotton separators, coffee roasting machines, etc. The idea is to allow rural communities to capture more of the value of the goods they produce, and also to reduce their vulnerability to fluxuations in the international prices for raw goods. [...] For example, in terms of a specific project, both Centre Songhai and MVV in Kemon are looking for machines to shell both sunflower seeds and sesame seeds. In both cases, there is currently no alternative to the current system of small-scale local production in the village which involves laboriously shelling both kinds of seeds by hand. Sunflower oil in particular is a nutritious and valuable commodity. Presses for the shelled seeds exist; a shelling machine would be an invaluable complement. [...] Another specific project is a machine to peel manioc (cassava), a starchy tuber grown throughout the tropics as a food staple. Maniocs come in a bewildering variety of shapes and sizes; as with sunflower seeds, the only means of peeling the stuff at the village level is by hand. [...] Given that the Centre Songhai is well served with electrical outlets, and many of the offices have computers, the trainees were initially skeptical of the the Kinkajou [projector's] utility. Early recommendations included adding the ability to play video cassettes and computer files. [...] Bill arrived ten or fifteen minutes into the demonstration, and pointed out that the Kinkajou would be a useful training tool for two Songhai centers in northern Benin, and their outreach programs in local villages. The discussion then moved onto more technical aspects of power requirements and the possibility of local manufacture.